As a result of new legislation, all sources of R22 refrigerant will be banned from use by January 2015. 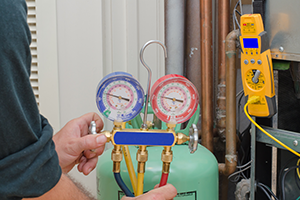 The option you have is to use a drop-in refrigerant to re-gas your system. Unfortunately this is only a short-term fix as your system will be working harder than before causing higher running costs and increased chance of system failure. Replacement parts are becoming increasingly rare and expensive so now is the time to think about replacement options. Air2London specialises in removing and replacing air conditioning and refrigeration products. We are able to decommission your old equipment quickly and efficiently, offering superior and more energy efficient alternatives. Modern systems of all kinds now use refrigerants such as R410a, which cause zero ozone depletion (have zero ozone depleting potential), rather than the polluting R22 equivalents. These refrigerants are also proven to be more energy efficient (than the R22 refrigerant) and are therefore a good choice for our customers. WHAT IS R22? R22 is an HCFC (hydrochlorofluorocarbon) which is currently used in most air conditioning systems over 10 years old in the UK. WHY IS R22 BEING BANNED? If R22 is leaked into the atmosphere, Chlorine is released and reacts with the ozone causing ozone depletion. R410a is the latest refrigerant and runs up to 40% more efficiently than R22. We know that this change means many companies have to undergo huge conversions and investment to ensure that they comply with the January 2015 deadline for complete removal of R22 refrigerant. Whatever your choice Air2London can provide you with the best solution tailored to your requirements.